It includes antibacterial activity, blood pressure reduction, antioxidant activity, reduction in the effects of diabetes, prevention of cardiovascular disease, and increased vigor after exercise. "Mostly apple cider vinegars have been pasteurized, filtered, refined or distilled in order to make the product took good, and thereby, more appealing to the general public. 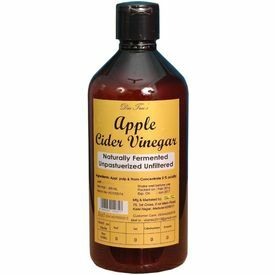 Unfortunately this extra processing destroys much of the healthy goodness and thus many of the apple cider vinegar benefits that were in the product. Once opened, an apple cider vinegar with at least 5% acidity does not need to be refrigerated and has a minimum shelf life of 5 years. Apple contains a particular type of fiber called pectin, which is good for preventing the body from absorbing cholesterol from the food we eat or produced by the liver. Therefore, it is very good for lowering blood cholesterol. Apple cider vinegar has shown great promise in improving insulin sensitivity and helping to lower blood sugar responses after meals. Studies suggest that vinegar can increase feelings of fullness and help people eat fewer calories, which can lead to weight loss. The acetic acid found in vinegar interfaces with the enzymes in your stomach responsible for digesting starch so you can't absorb the calories from carbs you've eaten.